The shinyrayed pocketbook is a freshwater mussel found in the Chattahoochee, Chipola, and Ochlockonee Rivers of Georgia, Florida, and Alabama. Freshwater mussels are marine mollusks that are able to move slowly through the sand, gravel, or silt of their aquatic habitat by means of a muscular foot. They have a close-fitting shell that protects them from predators and drying out when high up on the shore. The average length of this mussel is about 3.3 inches, and the shell is elliptical in shape, with a rounded top. The shell surface is light yellowish-brown and decorated with bright emerald green and black rays. The inside of the shell is white. The top of the shell of males are pointier then that of females (which are more inflated). 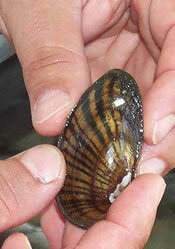 This mussel prefers stable medium-size to large freshwater river systems for its habitat. Young mussels are born as "glochidia" (larvae) until they undergo metamorphosis into mussels. As larvae, they develop by attaching themselves to fishes for a short life as parasites. The process is further complicated because not only do the glochidia have to find a fish, but it has to be one of several fish species for the life cycle to continue. The main host fish of this species is the largemouth bass (Micropterus salmoides) and the spotted bass (Micropterus punctulatus). As mussels, they attach themselves to the river floors and feed on phytoplankton, tiny zooplankton, and organic detritus that they are able to filter from the water using specialized regions of their shells. The water is filtered over the gills and the food particles become trapped and eventually digested. To reproduce, males release sperm into the water when the current is strong enough, allowing the sperm to travel and reach the eggs inside the shells of females. The fertilized eggs then develop into glochidia and grow inside the gill of the female until released into the water. In order to completely develop as mussels the larvae must find the host fish and attach themselves to its gills. 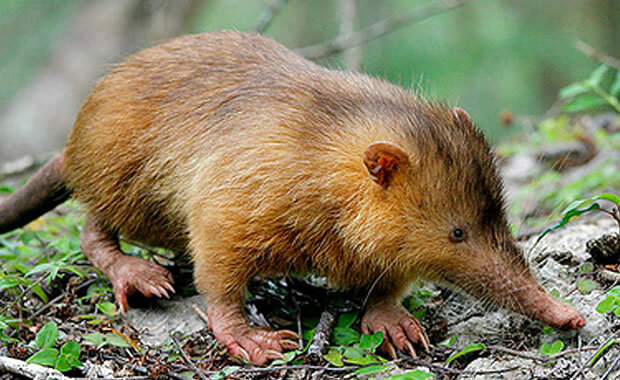 The main cause of decline for the shinyrayed pocketbook is habitat destruction due to deforestation. They have also been affected by siltation, dredging, channelization, impoundments, pollution, and competition with the invasive zebra mussel (a non-native mussel species). The host fish have also declined, which threatens the species ability to reproduce properly. Conservation plans include protection of its remaining habitat and the continued monitoring and study of all remaining populations. Copyright Notice: This article is licensed under the GNU Free Documentation License. It uses material from the Wikipedia article "Shinyrayed pocketbook". Glenn, C. R. 2006. "Earth's Endangered Creatures - Shinyrayed Pocketbook Facts" (Online). Accessed 4/25/2019 at http://earthsendangered.com/profile.asp?sp=766&ID=9. Need more Shinyrayed Pocketbook facts?